Before you can understand how a tooth dies, you must first understand how a tooth sustains its life. A tooth is made up of three different layers: the enamel, the dentin, and the pulp. Our smiles reveal our tooth enamel to the world, but it is the inner layers of the teeth that supply their livelihood. The dentin and pulp of the teeth consist of living tissues containing nerve fibers and blood vessels. As with all tissues inside the body, if the blood supply is lost then the tissue will die. There are two main causes of a dead tooth which include a serious infection and trauma to the mouth. 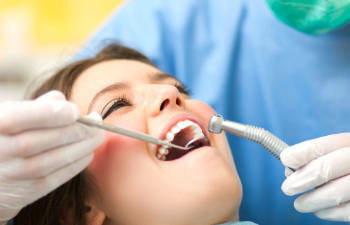 A simple cavity can quickly turn disastrous if it is not taken care of in a proper amount of time. A cavity is a small bacterial infection that eats a hole in the tooth enamel. If it is filled quickly, the damage can be halted and no further issues will present themselves. However, if a cavity is allowed to fester, the decay will travel deep into the inner layers of the tooth. As an infection continues, it will move to the dentin and pulp layers until the blood supply is cut off and the tooth dies. An infection will “zap” the nerves and blood vessels until they are no longer connected to the tooth. It is important that any dental issues be resolved so that they do not fester and cause irreparable damage. Once a cavity reaches the inner layers of the tooth, it will not be easy to ignore because of the pain and extreme sensitivity associated with it. Any indicators that your tooth has damage or decay needs to be addressed by your dentist immediately. Trauma to the mouth is also very damaging, and can cause the immediate death of a tooth. When a tooth is knocked out of its socket, it will be severed from the nerves and blood vessels. Many teeth die immediately when knocked out, but with immediate dental attention a tooth can be saved in some instances. However, no time should be wasted in getting to the dentist because no living tissue is able to survive without a constant blood supply. At Allen Dentistry, we want to prevent a dead tooth with exceptional dental care. Regular dental visits, checkups, and cleanings can catch cavities in their earliest stages, preventing decay from reaching the inner layers. If you are unfortunate to receive any trauma to the mouth, we will do our best to provide restoration for your smile.